Esophageal squamous cell carcinoma (ESCC) is the most common histological subtype of cancer in the upper and middle esophagus and is characterized by a high rate of mortality. The incidence of esophageal cancer varies greatly among regions of the world and occurs at a high frequency in Asia and South America. In our department, a 51-year-old man was diagnosed with ESCC after presenting with extensive disseminated skin nodules. Biopsy of the nodules showed metastatic ESCC. Cutaneous manifestations of esophageal neoplasia are very rare and are mainly described for esophageal adenocarcinoma (EADC). Here we report a very uncommon case of extensive skin metastases of ESCC. 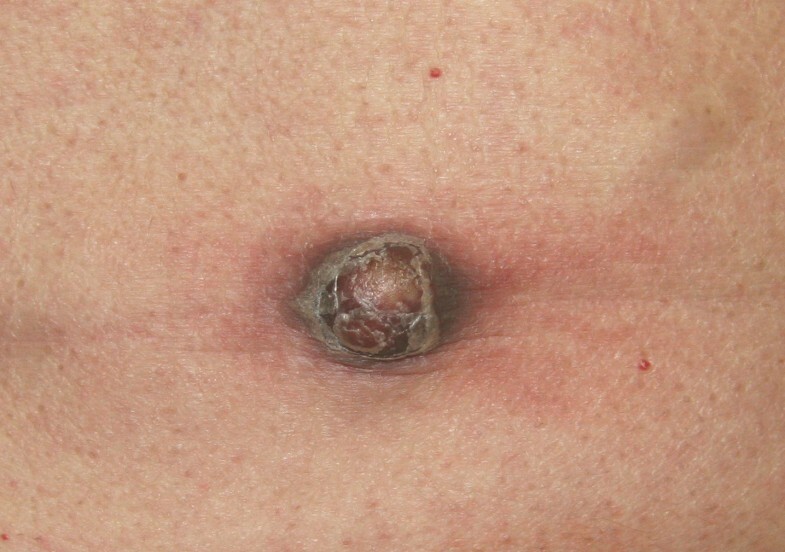 Early biopsies of suspicious skin lesions are important and should be performed in patients with unclear symptoms such as weight loss or dysphagia and especially in patients with a history of cancer, since they can reveal the existence of a distant malignant disease leading to diagnosis and prompt therapy. Cancer of the esophagus is the ninth most common malignancy and ranks as the sixth most frequent cause of cancer death in the world, constituting 7% of all gastrointestinal cancers . Patients with esophageal cancer usually present with disease that is locally advanced and which has already metastasized stage at the time of initial diagnosis. Cancer of the esophagus exists in two main forms with different etiological and pathological characteristics: esophageal squamous cell carcinoma (ESCC) and esophageal adenocarcinoma (EADC). ESCC is the predominant histological subtype, comprising about 70% of cases . In general, skin metastases from malignant tumors of the internal organs are rarely seen, with a frequency of between 0.7 and 9% [3–5]. The overall survival rate varies from 4.3 to 4.7 months . The cancer types most commonly associated with cutaneous metastases are breast, lung and melanoma [4, 7, 8]. Metastatic spread to the skin occurs either hematogenously or via the lymphatic system and presents in the form of rapidly growing papules or nodules [9, 10]. On histopathology, clusters of atypical cells infiltrating the dermis without connection to the adjacent epidermis can be seen . Here we report an uncommon case of massive cutaneous metastases of ESCC in a 51-year-old man. A 51-year-old man was admitted to our department with a four-week history of dysphagia, weight loss and nausea. He had a medical history of multiple sclerosis since April 2004 and a smoking history of 30 pack-years. The patient underwent esophagogastroduodenoscopy resulting in the diagnosis of esophageal carcinoma located in the mid-thoracic part of the esophagus. Histology of an endosonography-guided biopsy showed an intermediate grade ESCC according to the criteria of the American Joint Committee of Cancer (AJCC). Moreover, the patient presented with approximately 20 diffuse, painless and solid skin nodules that were about 1–3 cm in diameter, found all over his body surface including the scalp, upper extremities, axillae, back, chest and abdominal wall. According to the patient they had been growing rapidly over the previous four weeks, and he had noticed the first skin lesion more than two months earlier. Excisional biopsy of one representative prominent cutaneous formation on the abdominal wall was performed. On macroscopic inspection, the lesion was superficially ulcerated and measured 2 cm × 3 cm (Figure 1). 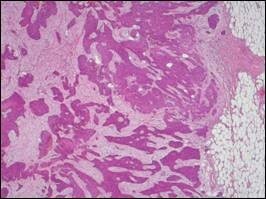 Histopathology revealed nodulous skin infiltration of intermediate grade ESCC (Figure 2). Interestingly, staging by thoracoabdominal computed tomography (CT) scan showed some of these skin lesions (Figure 3). Extensive mediastinal lymph nodes and multiple osteolytic lesions of the spine were also detected without signs of any other tumor manifestation (T1-2, N1, M1, G2; ESCC state IV). The patient subsequently received palliative chemotherapy with cisplatin (80 mg/sqm) and 5-fluoruracil (1,000 mg/sqm) given over four days every three weeks. After three cycles of chemotherapy, the cutaneous metastases became smaller, but some appeared in new areas. Representative ESCC skin metastasis on the abdominal wall Diameter 2–3 cm. Histopathology. 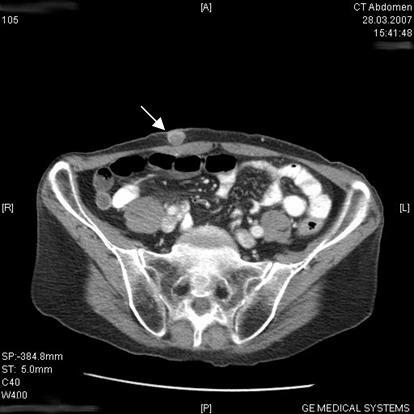 Infiltration of cutis and subcutaneous fat by intermediate grade atypical squamous cell clusters (HE). 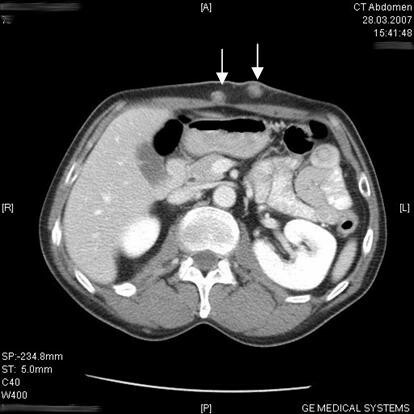 Thoraco-abdominal CT scan showing two representative cutaneous metastases (arrows). Due to the extreme rarity of cutaneous metastases from ESCC, there are only limited data in the literature regarding their incidence. Fereidooni and colleagues reported a solid facial skin metastasis of EACC . Two additional cases have been published discussing solitary metastases on a digit from an unusual variant of ESCC, the basaloid squamous cell carcinoma [12, 13]. Schoenlaub and colleagues reviewed the clinical findings and overall survival of 200 patients with cutaneous metastases of various cancers. The incidence of cutaneous metastases from EACC was 2 out of the 200 cases studied . The cancers most frequently causing cutaneous metastases were breast cancers (n = 64), pulmonary cancers (n = 36) and melanomas (n = 31) . Reingold reported clinical and necropsy findings of 32 cases out of 2,300 internal carcinomas. The most common primary site was the lungs (50%). The esophagus was the primary tumor site in just one case and this was an adenocarcinoma. The most common sites of skin metastases were on the chest and abdomen . Lookingbill et al reviewed 420 patients with cutaneous metastases from melanoma and carcinoma . In this study, tumor registry data from 7,608 patients was evaluated; 4,020 of these patients had metastatic disease and 420 (10.4%) had cutaneous metastases. The most common primary tumors causing cutaneous metastases were melanoma (n = 77) and breast cancer (n = 212). The esophagus was the primary site in only three cases, spreading mainly to the chest and abdomen . Tharakaram described five cases of skin metastases from ESCC in male patients . Skin manifestations of ESCC are extremely rare and only a small number of cases with solid skin metastases have been reported. A case of ESCC with such diffuse and massive skin metastases, most likely indicating highly aggressive disease, has not been described previously. Our patient complained about these unusual cutaneous metastases before any of the more usual symptoms such as dysphagia or weight loss were manifested. We thank A Niendorf MD and K Hamper MD for providing histopathological figures, T Göttsche MD for radiological diagnosis and HANSERAD for providing the CT scan pictures. GBI initiated the report and undertook the majority of the writing of the manuscript. AB made substantial contributions to the conception and design of the report and was involved in drafting the manuscript. GK, JM and SC made contributions to the conception and design of the report and was involved in drafting the manuscript. WF and CB made substantial contributions to the conception and design of the manuscript and revised it critically for important intellectual content. All authors read and approved the final manuscript.